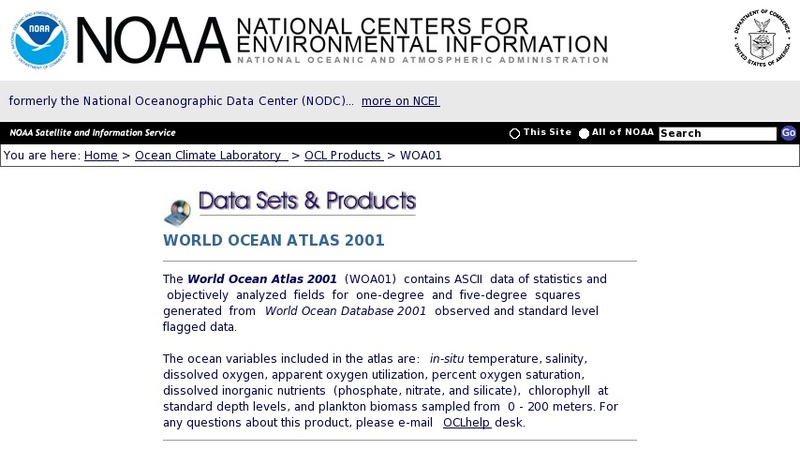 This NOAA National Oceanographic Data Center site contains a collection of interactive images generated from observed and modeled data. Users can select image parameters including ocean basin, time period, depth, and figure type. Topics include temperature, salinity, oxygen (dissolved oxygen, apparent oxygen utilization, and percent oxygen saturation), dissolved inorganic nutrients (phosphate, nitrate, and silicate), chlorophyll at standard depth levels, and zooplankton biomass sampled from 0 - 200 meters. Images may be viewed in jpg or pdf formats.